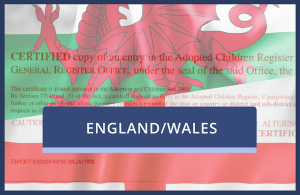 UK Adoption Certificates provide proof of birth for adopted persons to be used around the world. We can supply you with an official adoption certificate replacement from the archived certificate stored at Somerset House, issued at the time of the adoption court hearing. 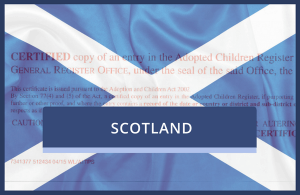 Any adoption recorded within England, Wales, Scotland or Northern Ireland can be re-issued by Vital Certificates. We supply official Adoption Certificate replacements from the archived certificate issued at the time of the adoption court hearing. 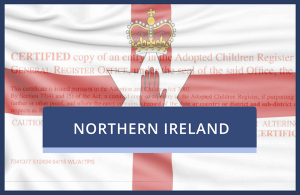 Any adoption recorded within England, Wales, Scotland and Northern Ireland can be re-issued. The main difference between the birth and adoption documents is that the adoption certificate shows the adoptive parents, whereas a birth certificate shows the names of the birth parents. Adopted persons are often requested to provide their birth certificate when applying for passports, drivers licences, or job interviews. This is not required under UK law as the original birth certificate may not be available to you if you are unaware of your birth name. In all cases, you should provide your adoption certificate, which includes details of the adoptive father and mother, as this certificate replaces the original birth certificate. In fact the original birth certificate will have been written on to show that it is no longer valid and that it has been replaced by the adoption certificate. Under UK law, adoption certificates are known as Public Records which means that any person can apply for a copy of any certificate, providing that they know the details of the adopted person that is required. This can be helpful for both government and legal services needing proof of identity. Please note however that where we believe an application to be connected with an attempt to obtain information for the purposes of identity fraud, the application may be rejected and details passed to the relevant police authority. If you need an official adoption certificate replacement call our professional and friendly team NOW on +44 (0) 330 088 1142.